292 pages | 7 B/W Illus. Individual Counseling and Therapy, 3rd edition, goes beyond the typical counseling textbook to teach the language of therapy from the basic to the advanced. Lucidly written and engaging, this text integrates theory and practice with richly illustrated, real-life case examples and dialogues that demystify the counseling process. Readers will learn how to use winning skills and techniques tailored to serve clients—from intake to problem exploration, awareness raising, problem resolution, and termination. Students have much to gain from the text’s depth, insights, candor, and practicality—and less to be befuddled by while they develop their therapeutic voice for clinical practice. PowerPoints, chapter test questions, and an instructor’s manual are available for download. "Counselor/therapist trainees have many questions and concerns about what they could face in developing a therapeutic relationship with clients. 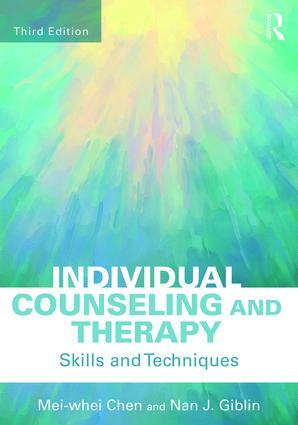 Individual Counseling and Therapy is a resource that provides counselors and therapists with a touchstone on topics of basic and advanced counseling and therapy skills, such as addressing the difficult client and understanding diversity in the therapeutic relationship, and has a variety of content for the beginning and seasoned counselor and therapist. The impact of this book is the reminder of all that we do as a counselor/therapist." "Counselors in training and veteran professionals will find value in this new edition by Chen and Giblin. The authors’ years of experience and their expertise allow them to create a text that is easy to read and comprehend but also leaves readers feeling supported and well-prepared to practice new skills with their clients. Readers also gain needed awareness of essential aspects of the counselor-client relationship that too often receive inadequate attention in many similar texts or in the classroom." "An outstanding guide for those of us interested in learning or improving the craft of a therapeutic conversation. Chen and Giblin have put forth the most valuable information in a straightforward and comprehensive way. The book is easy to read, full of helpful advice, and covers a variety of topics in a rich, step-by-step way. It will be among my favorites. A classic gem for beginners as well as veterans of the profession." Mei-whei Chen, PhD, is a professor at Northeastern Illinois University, where she teaches individual counseling, group counseling, theories in counseling and psychotherapy, mental health counseling, grief counseling, and stress management. She has received the Faculty Excellence Award three times and the Beverly Brown Award. Dr. Chen is also a clinical psychologist in private practice. Nan J. Giblin, PhD, is a professor emerita at Northeastern Illinois University, where she was a professor in counselor education for 30 years and served as dean of the College of Education and department chair. She received the Counselor Educator of the Year Award (2010) in Illinois. Dr. Giblin is also a clinical psychologist in private practice and specializes in supervision, grief counseling, and issues related to aging.